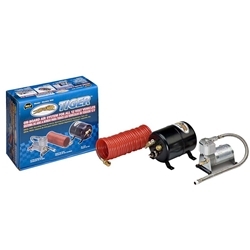 ONLY 3 LEFT --- Tiger Tank And Compressor An easy to use two piece air supply system consisting of an air storage tank, compressor (air pump), 1/4" air hose, fittings, and hardware. The tank has a built-in regulator to maintain preset air pressure. All moving parts of the compressor are manufactured to strict standards. The compressor's motor is carefully balanced and then mounted on heavy rubber bushing's, virtually eliminating all vibration. Air hose fittings are made quality brass to insure leak free installations. for use with a standard 1/4 hose. The Model 800 comes with a 20 ft coiled air filler hose with fittings to inflate tires , shocks, rafts, or any application requiring air.